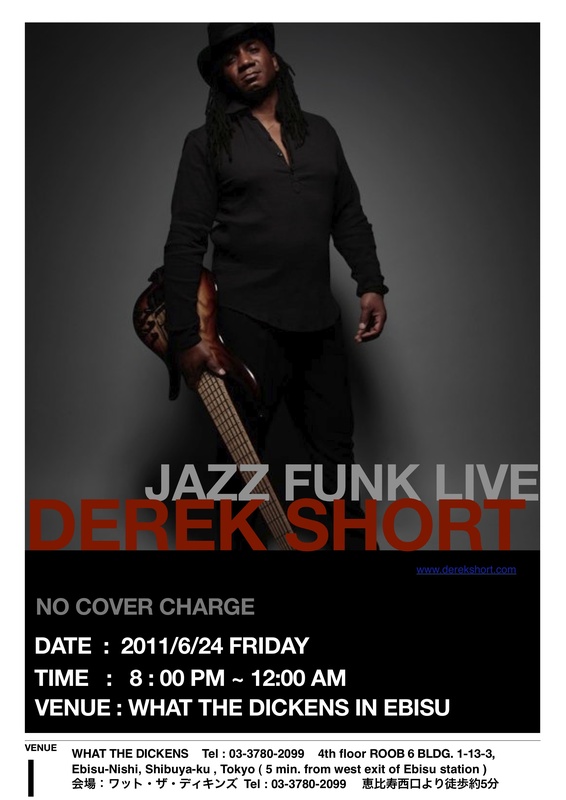 6/24 (金) Derek Short Jazz Funk Fusion Trio @ What The Dickens (恵比寿) | Tetsu What ? 20:00～23:30(3 Set) ミュージックチャージ無料 What The Dickens is a nice casual British style bar with a very friendly atmosphere and great food . There is NO COVER CHARGE for this show . Hello Everyone !! , Once again I will be doing my monthly session gig at What The Dickens ( http://www.whatthedickens.jp/map ) in Ebisu on Friday, June 24th from 8 pm – 12:00 am . Lots of special guests will be sitting in and because it is going down on a Friday this time there will be NO HOLDING BACK !!! We will be laying down the FUNK !!! That’s right . Uncut Funk !!! This will be a FREE show . If you’ve got time , please come on down and hang with us . As always , What The Dickens is a nice casual British style bar with a very friendly atmosphere and great food . There is NO COVER CHARGE for this show . Thanks and take care .